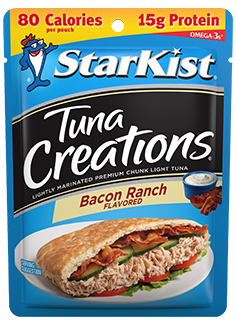 A smoky bacon flavor adds another level of flavor to classic Ranch seasoning on our premium chunk light tuna. With 15 grams of protein and 80 calories, each single-serve pouch provides a smart (and zesty!) boost of protein to any salad, wrap, or can be deliciously enjoyed right from the pouch. Packed in our no-drain, flavor fresh pouch, it’s easy to take anywhere and eat anytime.